I’ve been told some stories about Isla Mujeres, a tiny island off the coast of the Yucatan Peninsula in Mexico. That it’s so small, visitors and locals use golf carts to get around. That if you time your visit right, you can swim with whale sharks. That you mostly spend your vacation days sitting on a beach. 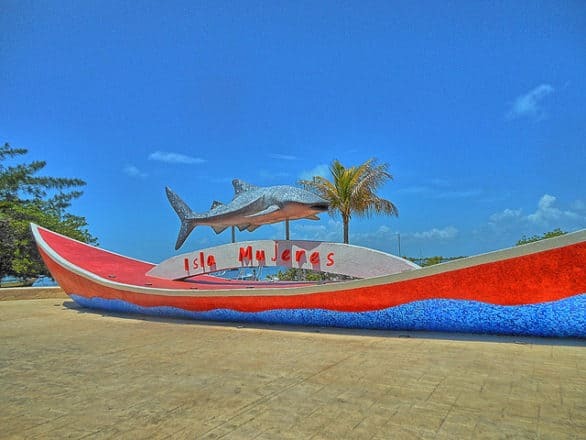 Statue of a whale shark on Isla Mujeres (which is probably how close I’ll get to seeing a real one since I’m not going during the season you’d find them in Mexico). Photo by Kirt Edblom on Flickr. This is on the bucket list, but I know full well I won’t be doing it. Wrong time of the year. If you want to swim with these gentle giants, you need to visit between June and September. Isla Mujeres is about 5 miles long, so it’s entirely possible that I will be at Playa Norte daily without much of a hassle. It’s the most popular beach on the island. You’ve got to love a vacation destination that’s small enough to explore that all you need is a golf cart. Photo by Shinya Suzuki on Flickr. 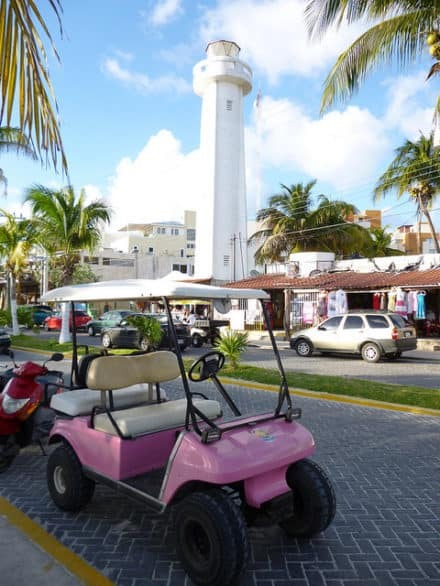 While we plan on getting around the island by bikes most of the time, it sounds so fun to rent a golf cart and zoom around the island. It’s a small island but it is loaded with good restaurants. A lot specialize in fresh seafood because, come on, it’s an island. Among the ones that rank high on travel lists and get featured on blogs a lot are Ballyhoo Restaurant & Margaritas, Mango Cafe and Lolo Lorena. Lolo Lorena sounds like an especially unique dining experience. 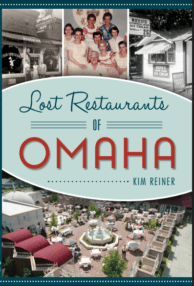 I also have Bastos Grill, Greenverde, Ruben’s and La Lomita on my list. While on the topic of eating…Yucantan has some noted foods that I want to try, including a citrus roasted pulled pork specialty that originated there called Cochinita pibil. I read about it here, a post about Mexican food I’ve never heard of before, including fruits like nance fruit and guaya fruit (which sounds trick to eat), and cheese-stuffed street food called marquesitas. 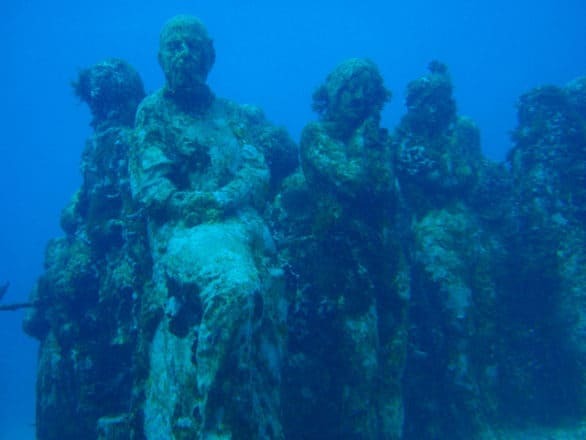 The surreal-looking sculptures that create a reef in an underwater museum in Mexico called Museo Subacuatico de Arte. Photo by Andy Blackledge on Flickr. There’s a surreal-looking sculpture garden off the island is not only beautiful to see while snorkeling or diving, it’s also functional by contributing to the reef structure and growth of coral. I’d love to see the Museo Subacuatico de Arte, plus learn how it helps keep the environment healthy for marine life. More information here. This place looks like a nice place to purchase homemade gifts to bring home. The island has a sanctuary for sea turtles called NAME. Here, they have a hatchery and regularly release the hatchlings to sea. 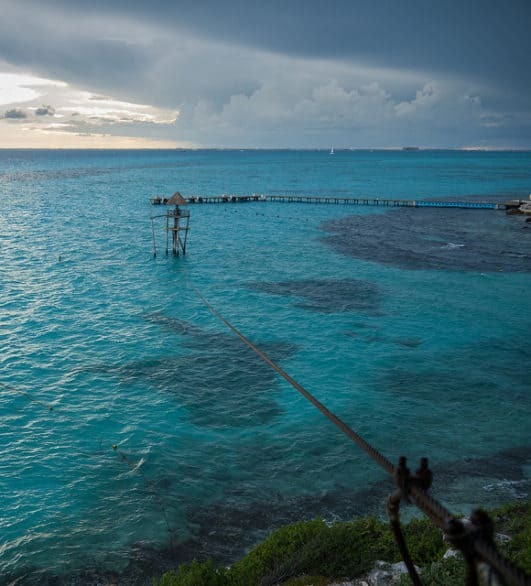 You can zip line over the ocean on Isla Mujeres. Photo by Grisha Levit on Flickr. How often do you get to zipline over an ocean? Garrafon Natural Reef Park offers that experience on Isla Mujeres. There is a man-made island found on Isla Mujeres that’s kept afloat by recycled plastic bottles (it’s called Joyxee Island or Joyxee Island II). A quick tour can be arranged. Sounds like the sort of oddity I need to see while on vacation. 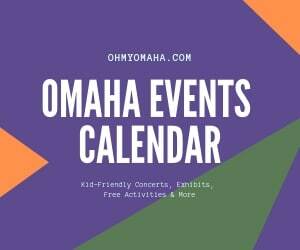 Here’s the Trip Advisor page on it. Update: I’ve been informed that the bottle island is no more. If you want to read what other travelers said about its demise, visit this forum. You can find incredible ruins in Mexico, and for the best preserved, I know we need to go to the mainland. Isla Mujeres does have some remains of ruins, though. Being on the east side of the island, they’re said to be important in that they’re the first to have the sun hit them each day. Our little hotel has some kayaks available for guests to use, so why not try sea kayaking? Since this is a bucket list post, I’d like to imagine we’d have a guide who’d take us to gorgeous locals. The likely scenario, though, will be that Mr. Wonderful and I will strike out on our own and we’ll get tired 5 minutes into it. Mexico is known for cenotes, underground, water-filled caves. There aren’t any on the island, so if I were to swim in one, I’d have to go inland. There are a few on the Yucatan, so who knows? Someday I’ll find one. We opted to book a small hotel located outside the busy island center. It had a small pool overlooking the ocean. Isla Mujeres has a range of hotel accommodations to suit any budget, including luxurious options. Check out Isla Mujeres hotels on TripAdvisor, where you can see guest reviews as well as what amenities are available at each. Everything on this list is acheivable! 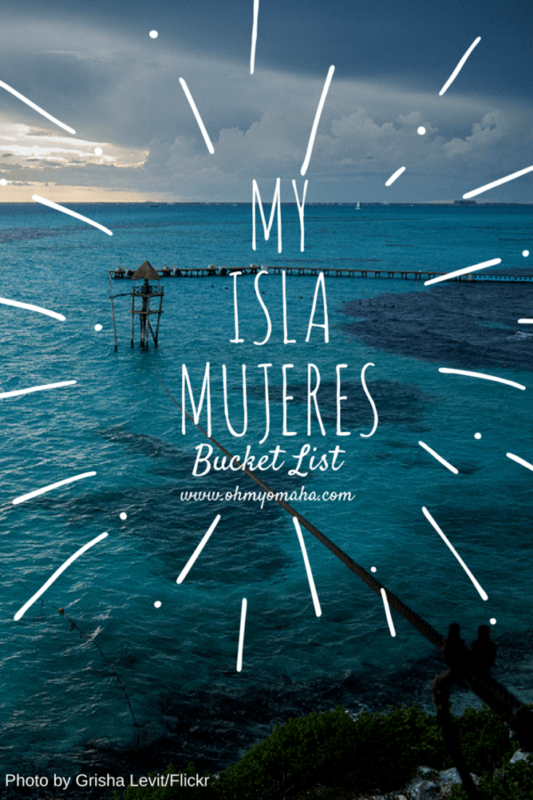 I have been to Isla Mujeres twice and these things are all very cost friendly and so much fun! Near the swimming with dolphin place there is a statue garden place and it was so cool and unexpectedly beautiful! It cost about $3 to get in but it was totally worth it! We got some of the best pictures there! The floating bottle island is no longer there. No mention of the lighthouse? That’s too bad about the bottle island! Thank you for the heads up. I’ll make note of that in the post. No, I didn’t include any of the lighthouses in this bucket list. There are three there. I don’t usually seek them out on trips, so I never think of including them on any bucket list for seaside destinations.